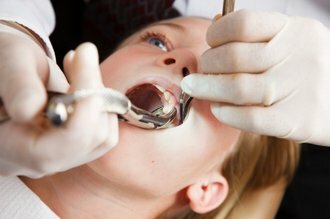 An extraction is the removal of a tooth or teeth that have become non-restorable, non-useful, or harmful to the patient. Impacted teeth and wisdom teeth that can potentially cause problems, like infections, need to be removed as well. The gum tissue around the wisdom tooth is cut open to reveal the tooth. The tooth is loosened by gripping it tightly and wiggling it back and forth until it can be lifted out of the gums. Sometimes a tooth may be impacted so tightly that it cannot be simply lifted out of the gums. In cases like this the tooth will be broken up into pieces first before being removed. Depending on the incision and extraction site, sutures may be needed to close the area. Soluble sutures are the best option, which will dissolve on their own. After the surgery you will need to rest. You can expect for the extraction site to bleed for a little while after the surgery. Gauze will be applied at the completion of the surgery, and you will need to change it when it becomes soaked. If bleeding continues for longer than 24 hours you should call your dentist. Rest when you return home, but do not lie flat. This could prolong the bleeding. Prop your head up on a pillow when lying down. Your dentist will prescribe you pain medication if necessary, so if you become sore take as directed. You can also use an ice pack for the pain. Your dentist might also provide you with a cleaning solution to clean the extraction site.